5B Investments, Inc. is an active corporate citizen committed to strengthening the communities in which we live and work through philanthropic support of health, welfare, and education. 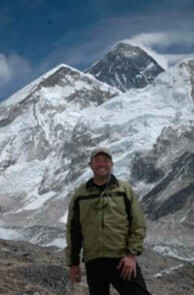 In 2006, 5B Investments, Inc.’s Founder Chris Stephens returned from Nepal after climbing to Everest Base Camp with his daughter. He shared how the experience impacted him and reflected the organization’s culture of giving in the Newsletter for Mach Robin and Red Robin Restaurants.